Shhh! It’s early and we don’t want to wake the house up. There is a clear starry, starry sky and the promise of a decent frost when morning comes. 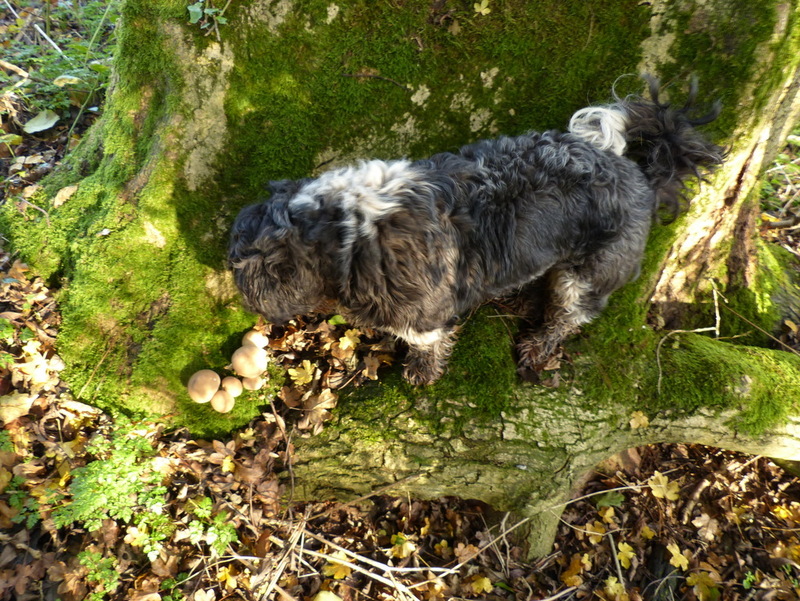 Fizz and I have been finding good mushrooms over the last couple of days and there is time to show you some of them before the frost. 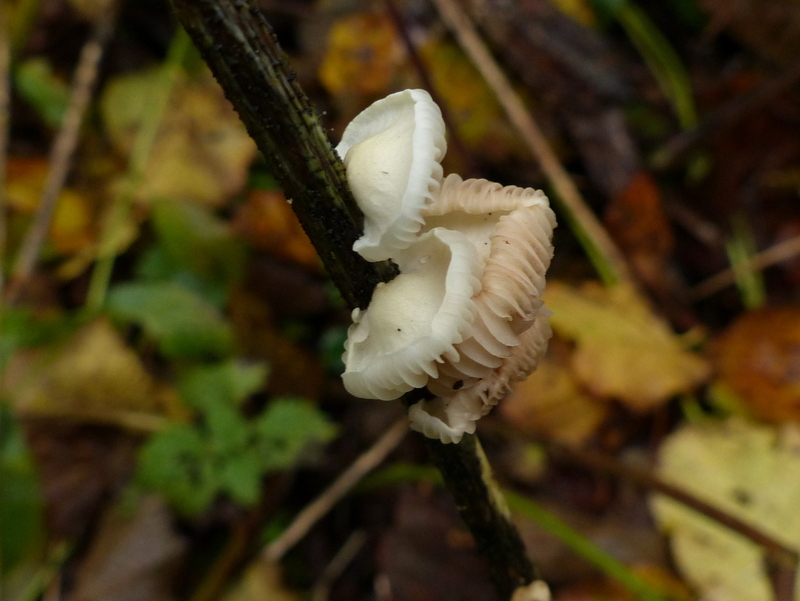 They are growing on the stem of a Stinging Nettle and whilst it is common to find brackets on dead wood I don’t often find them growing on green plant material, Oysterlings do though. 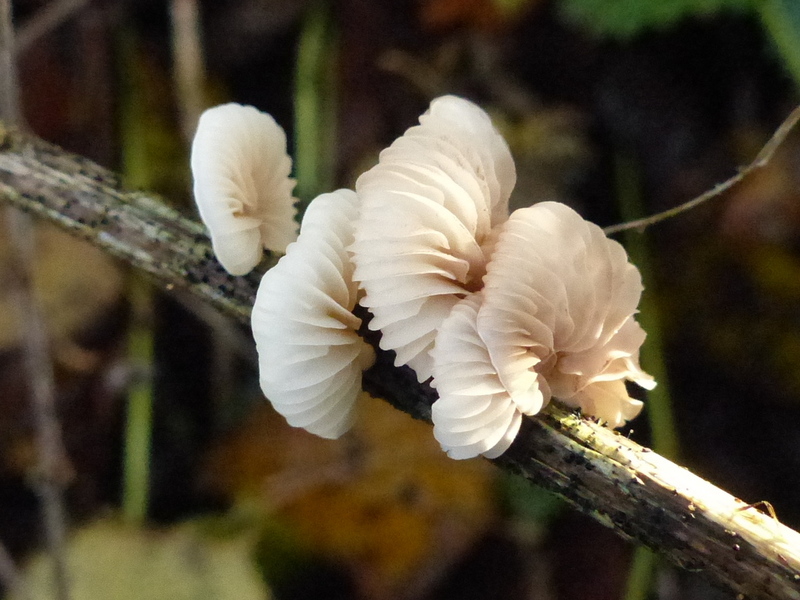 They can even form on dead leaves. They must have a very quick life cycle. There is no chance of keeping one of these as a pet as their home will rot and disappear very soon. 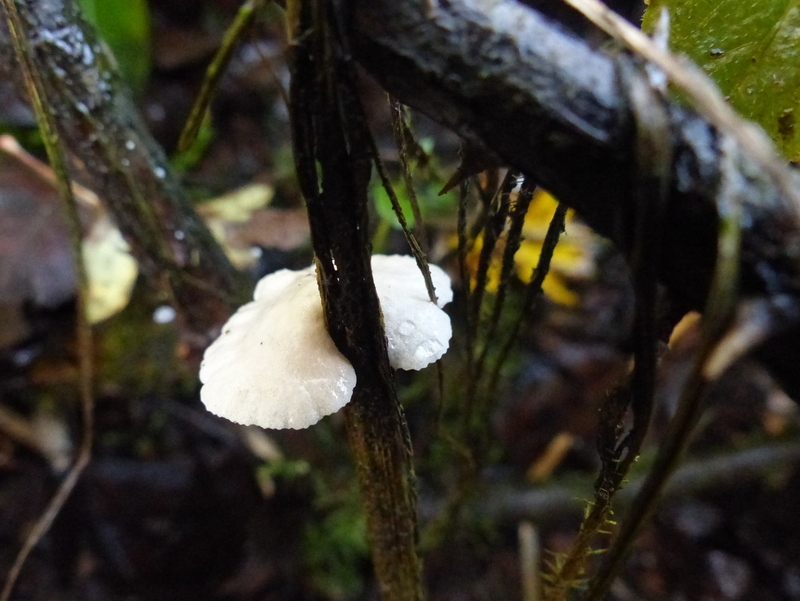 There are quite a few Oysterling species, they belong to the genus Crepidotus. Many of the species can only be identified under a microscope by looking at the shape of the spores. 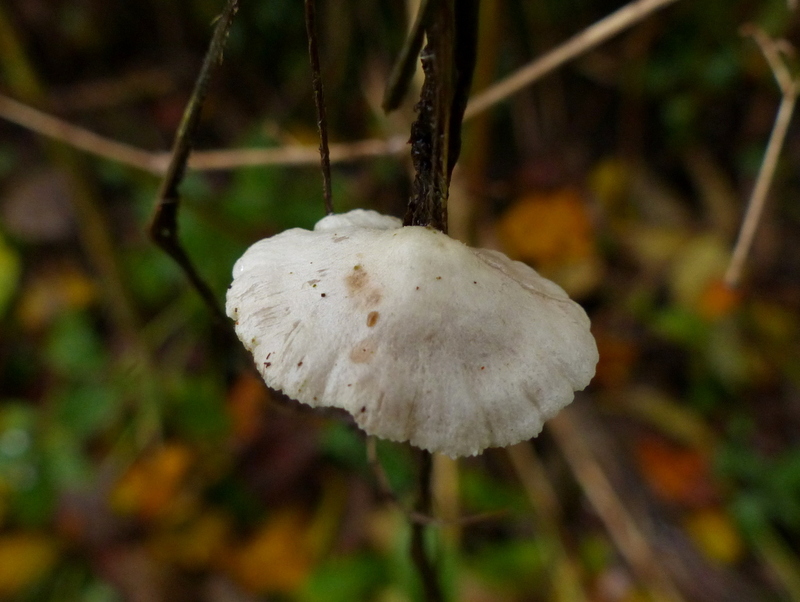 You might see this one identified elsewhere as a Variable Oysterling but without pictures of the spores that is just a guess, there are other common species that look identical. It is just an Oysterling. I think that the plant matter that this one is growing on is just a more decayed nettle stem. That is Oysterlings, moving along the track, here is one that would make an excellent pet. You know what that is, don’t you? 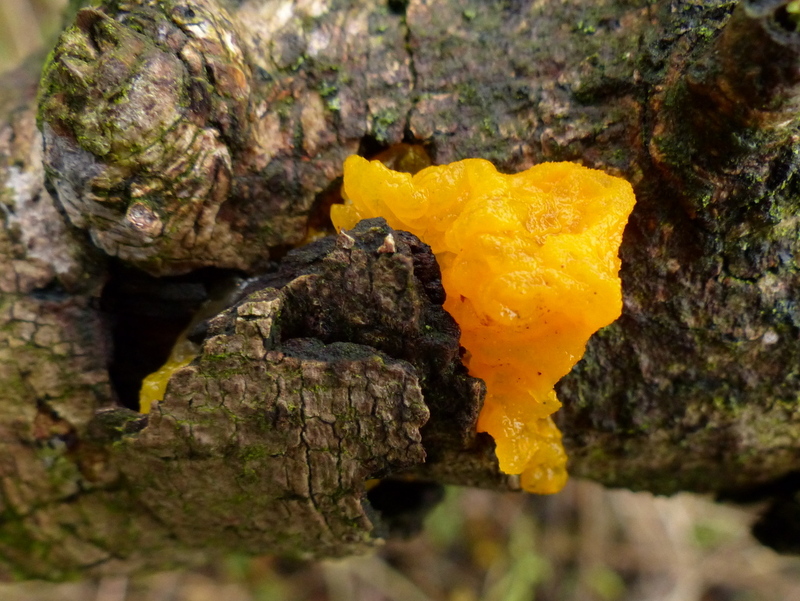 Tremella mesenterica, that is our Yellow Brain Fungus. 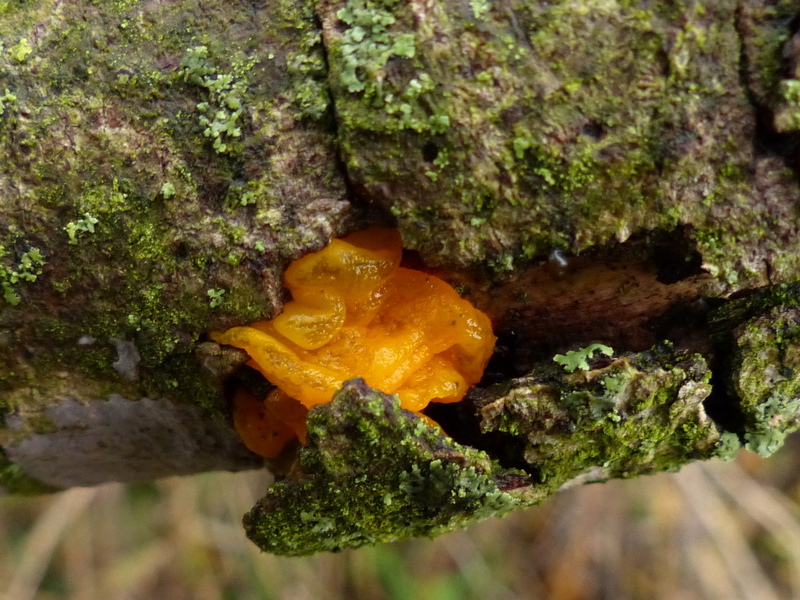 I was just captivated by the way that it is pushing out from under the bark. 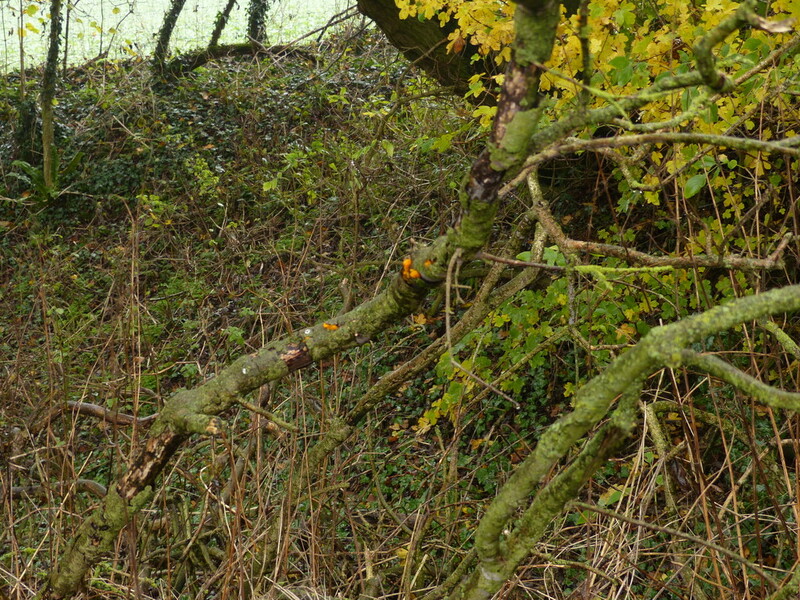 I think that the wood is Ash, given that it is a large branch under an Ash tree. These next mushrooms are puffballs. Yes, good Dog. Get out of the tree. 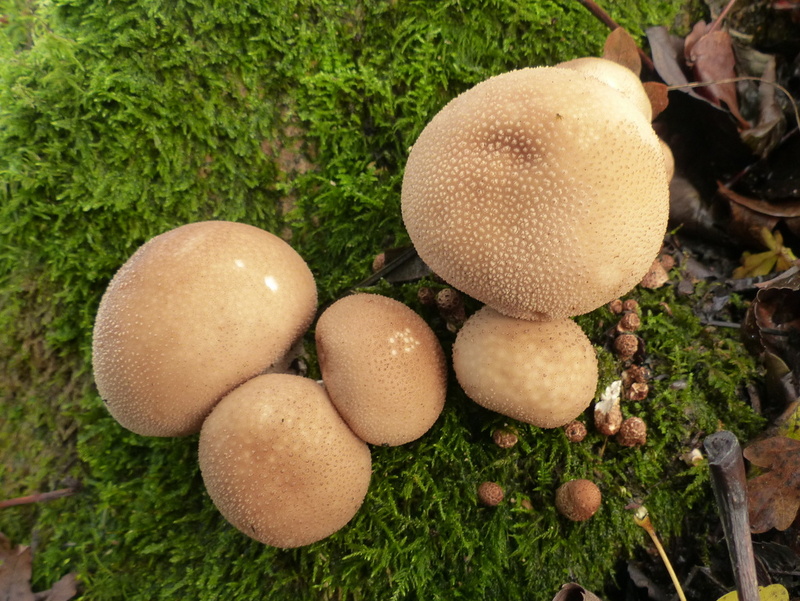 These are Stump Puffballs also called Pear-shaped Puffballs, Lycoperdon pyriforme and the second part of that Latin name literally means Pear-shaped. 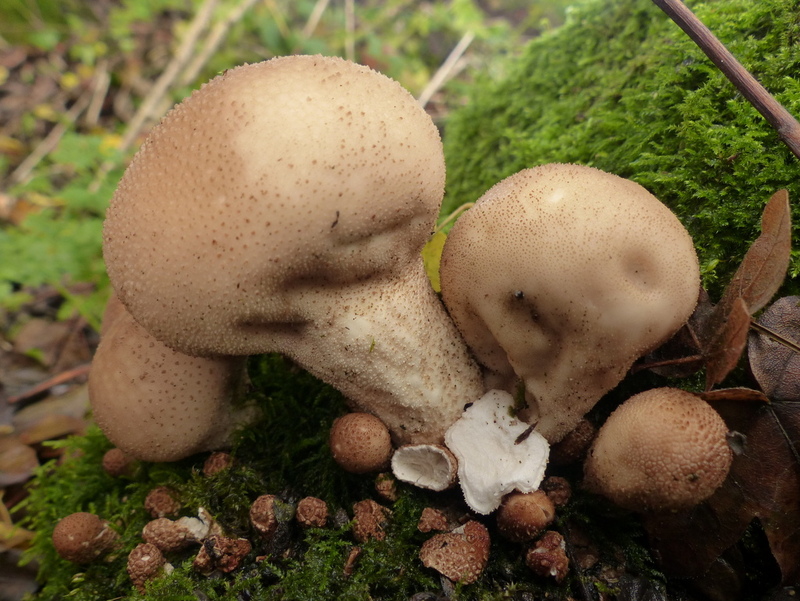 Puffballs are great because you can eat them and they are very good. 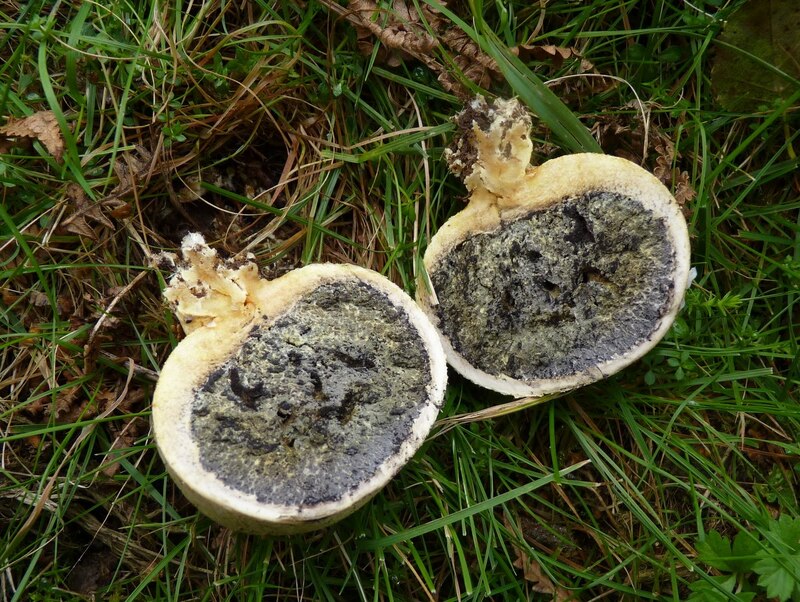 There are no poisonous Puffballs, they are all good so it is a really good one for beginners. What you do have to do is cut them open. Inside they should be pure creamy white. 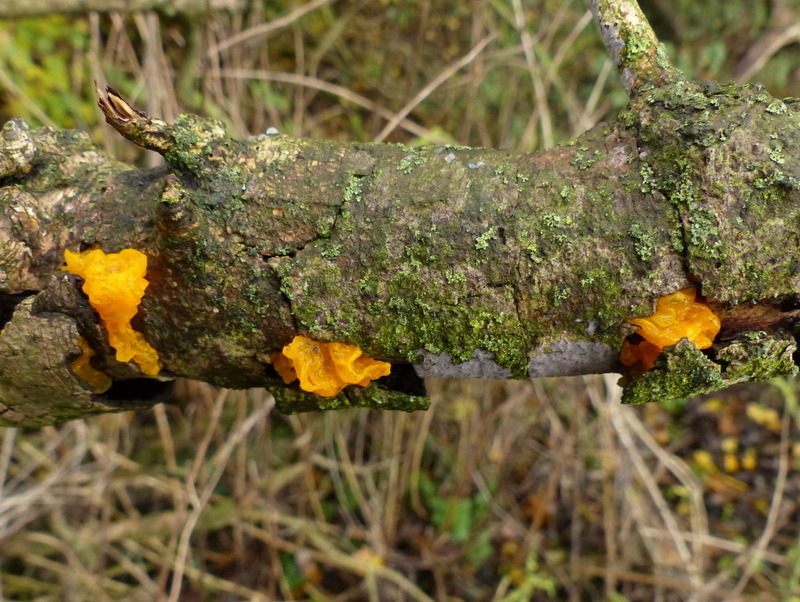 Once they start to yellow they are no good, don’t eat those. Whenever people talk about eating puffballs they give the following warnings. 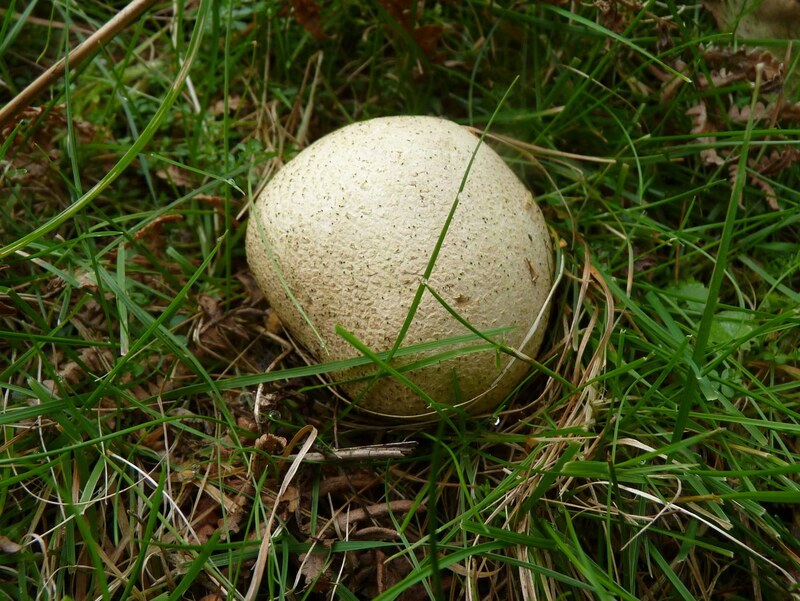 The Common Earthball (poisonous) can be mistaken for a Puffball. 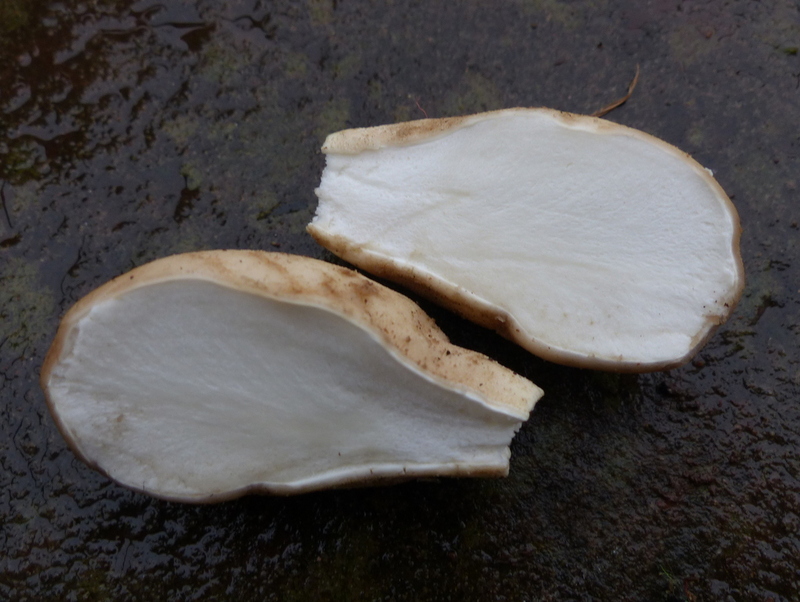 You must cut your Puffball to ensure that it is white and so long as you do that you will never mistake an Earthball for a Puffball. 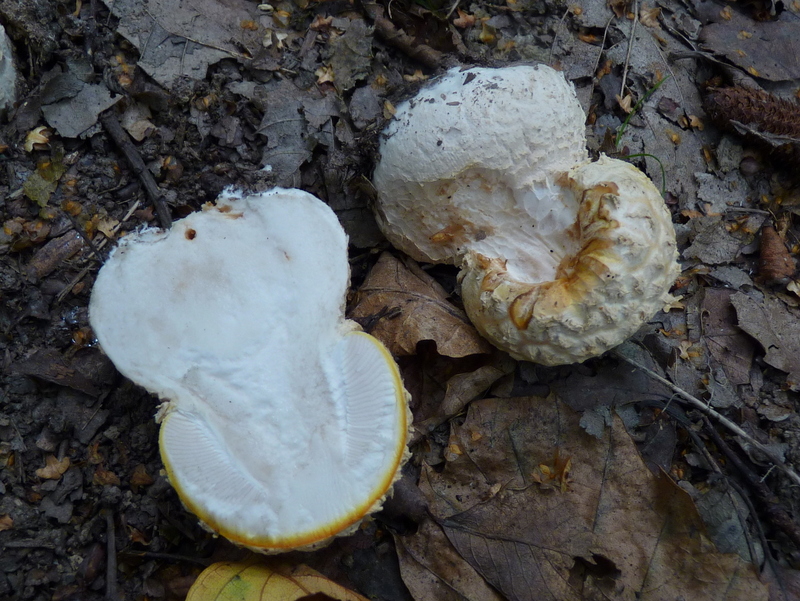 Also Immature Amanitas (Very poisonous) look a bit like Puffballs. 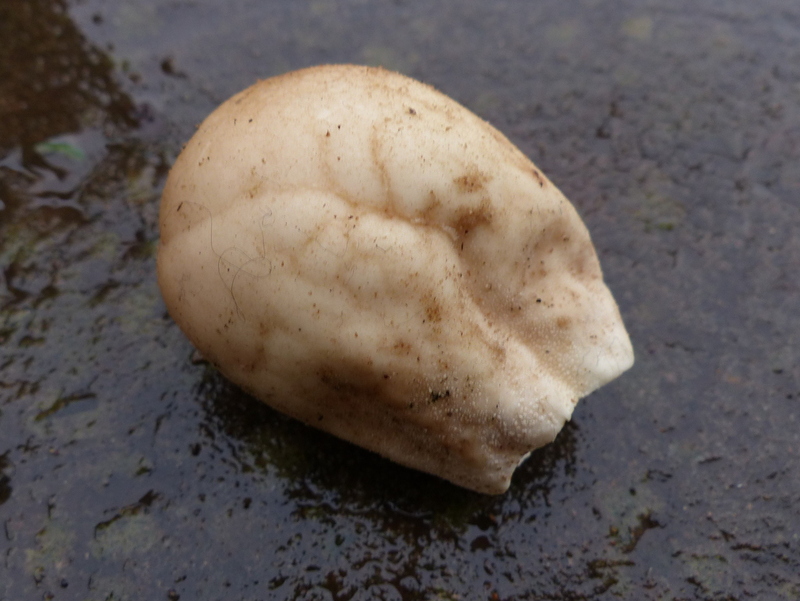 This picture isn’t brilliantly clear but, same thing, inside you will find stem and gills forming and not the smooth white texture of a puffball. If you cut your Puffball and you must, then you can’t go wrong. 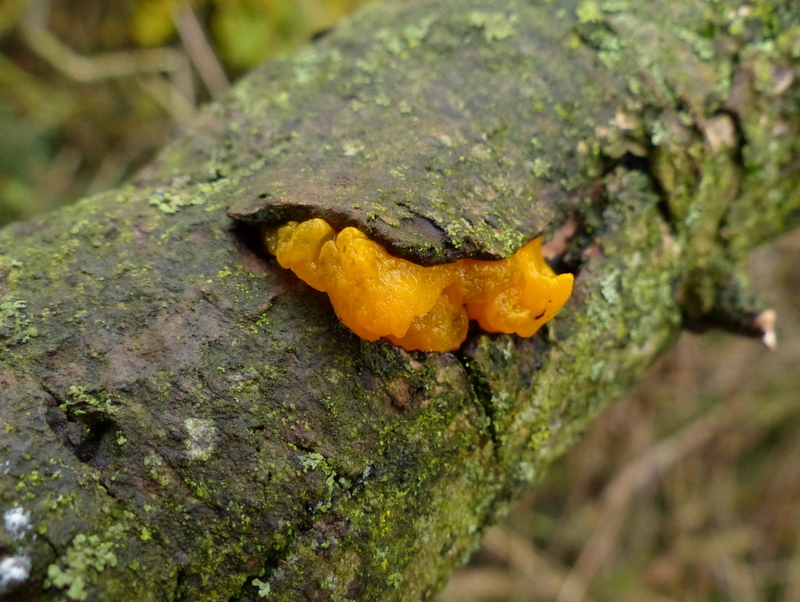 This is nothing to do with examining spores under a microscope, we can’t see the shape of them with naked eyes but very often the colour of the spores can be a good clue to identify a species. I am not going to get this one to species. 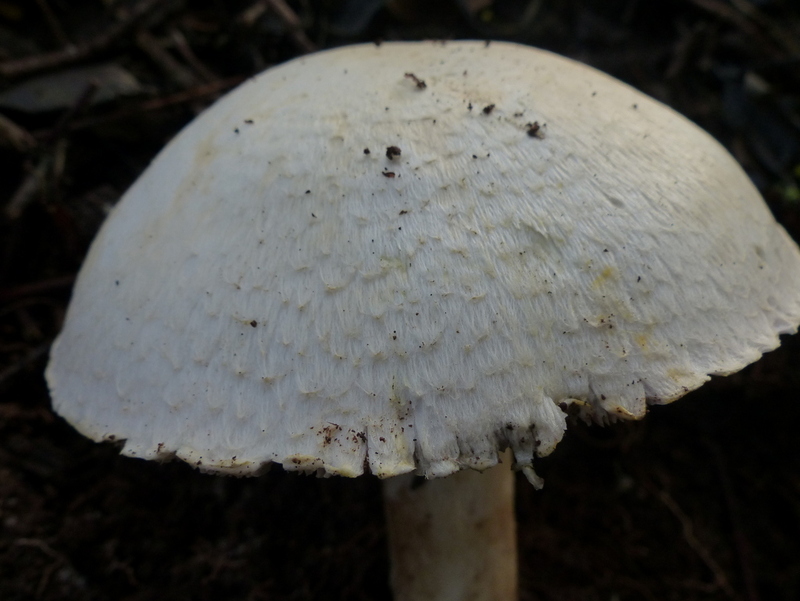 It is a nice mature Agaricus. 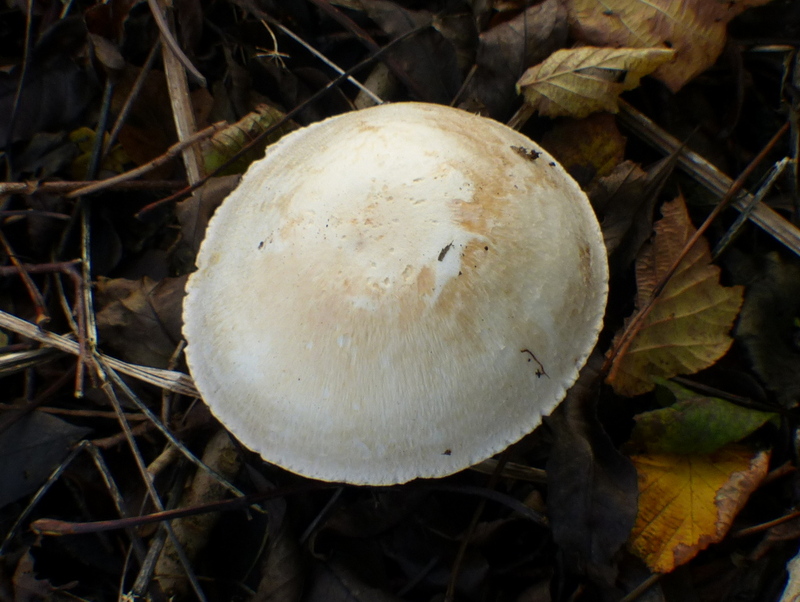 It could be a Field Mushroom but it doesn’t quite fit the bill, it isn’t growing in a field and it smells of aniseed. 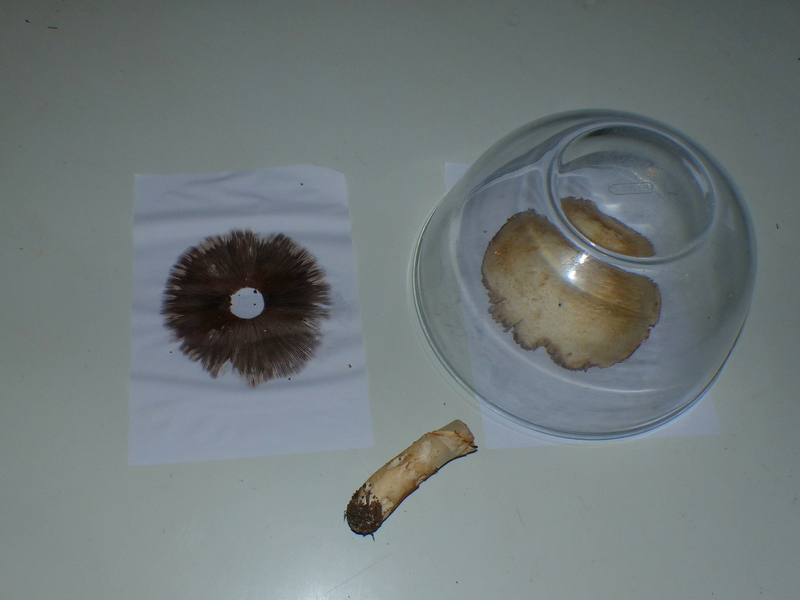 That doesn’t matter to me, it will do well to illustrate my spore print. 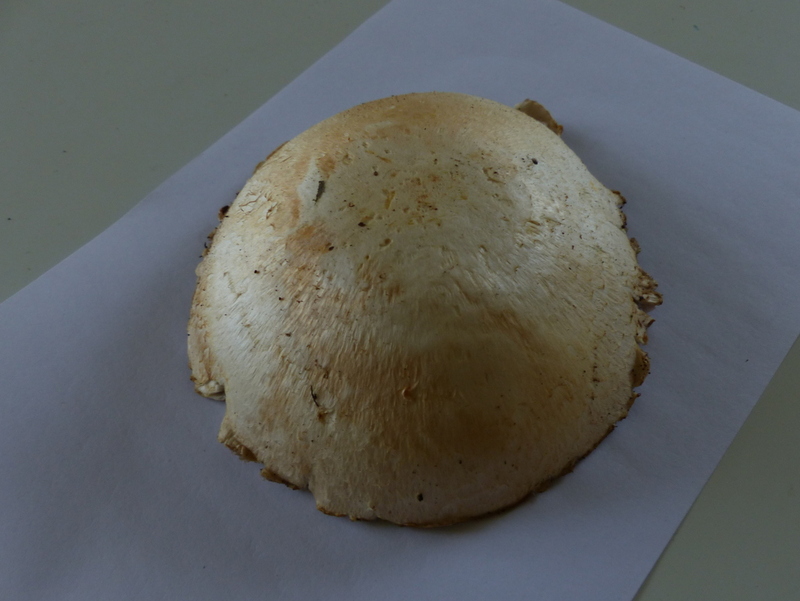 So cut off the stem and lay the cap, gills down on a piece of paper (Card might have been better). A lot of people recommend using black paper because the spores are often light in colour, I know what to expect from this one so I have gone with white. 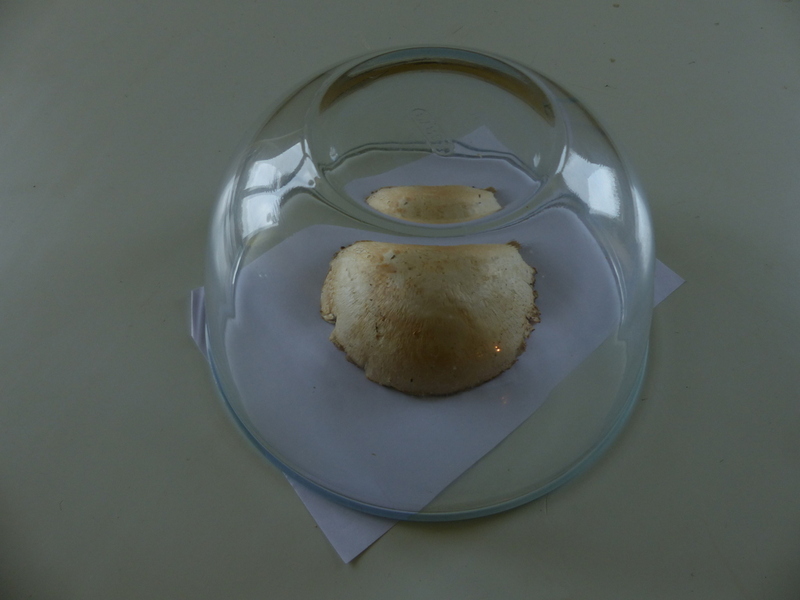 It is best to cover the cap with a bowl. It is going to drop spores anyway but that will stop them from being disturbed. I left this overnight and I got a good heavy print that left me in no doubt to the spore colour. Sometimes people want to take a print for artistic purposes and I thought that my heavy print had lost a lot of detail. You can fix the spores in place with a dusting of hairspray, just be careful not to blast them away with your spray. So I did another one and I left this for just one hour. I could have done many more as heavy as I liked. You need a mature open mushroom to do this. 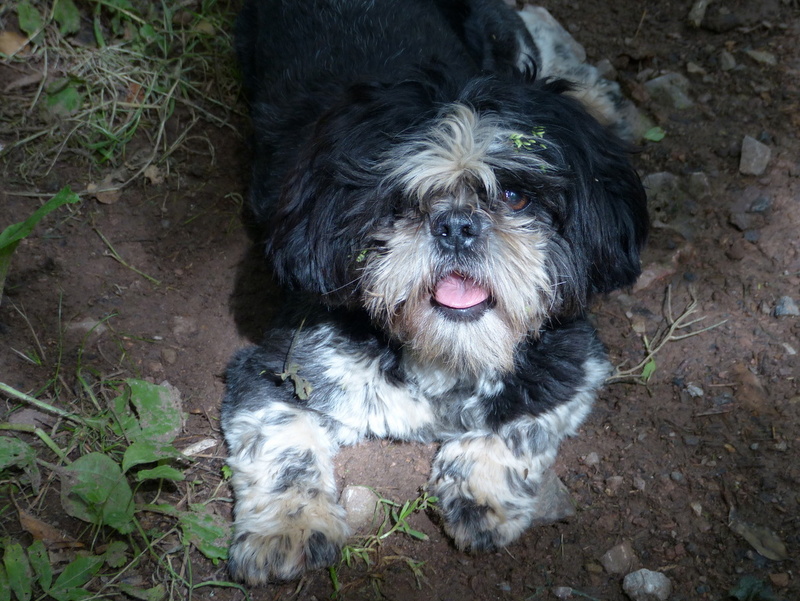 The Truffle Hound is in fine form, Colin. If she can split Japanese from Manchurian Bush Warblers then I’d like to borrow her for a while. Thank you Andrew 🙂 She is a Nature Detective Dog in training, give her time. Thank you Jane 🙂 I don’t know much about Australian Fungi but as every thing else there seems so unique I would bet that you have some really interesting mushrooms. 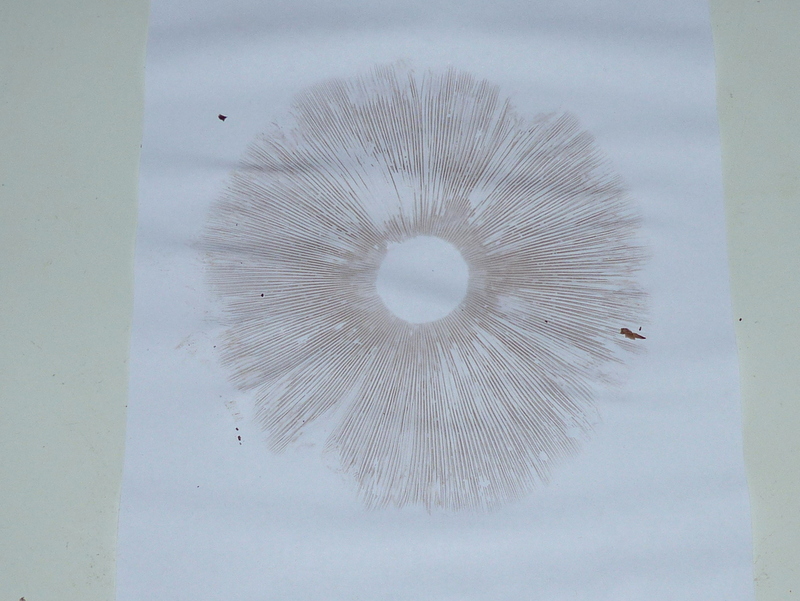 I wish you’d told me about spore prints years ago when I was still teaching. But it’s too late now. Thank you John 🙂 The kids would love that kind of thing, especially getting different shapes and colours. You would have to be careful they didn’t eat them though. I am still laughing while I type this – eating my toast!! Not really – I braved the frost and ice yesterday and the fog this morning and here I am still in one piece. I loved this beautiful post – so informative and lovely to look at. I am watching woodpigeons eating ivy berries at the moment. Thanks Clare 🙂 Just outside of my door there is a grapevine trailing across a roof. It is alive with birds and mice. Tiny little Wrens seem to live in it all year round and the grapes are very popular. I just opened my door and saw a Song Thrush on it. We don’t see many of them around here these days. 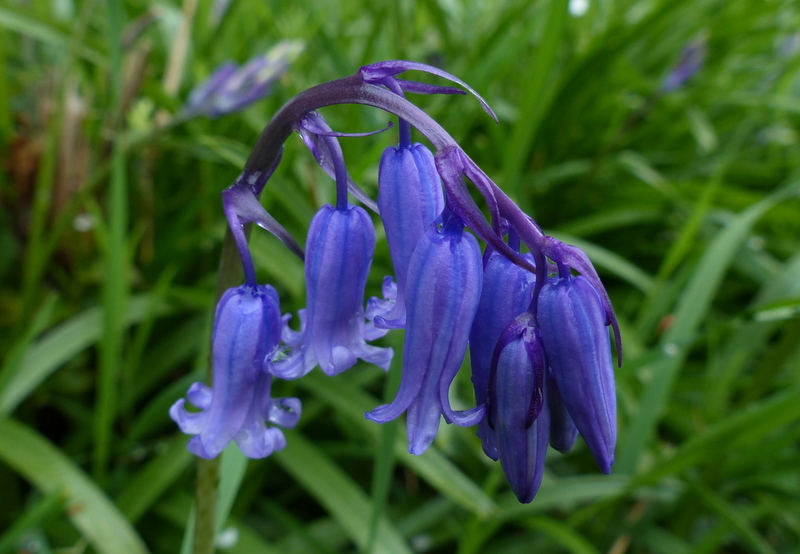 Yes you are right – they aren’t as common as they used to be. However, we had more this last year than for a long time. I think because of the wetter summer they had more to eat. Worms and slugs and snails were more plentiful. Amazing as I thought it was a drawing! Thanks for all the info but still not sure what I will eat next in the wild fungi line! Hi Collin. Thanks for all the ‘shrooms. It’s a really interesting area that I haven’t spent much time with. Your great photos and descriptions make me want to start poking around my own backyard. Thank you Dennis 🙂 I have to make the most of the mushrooms at this time of year, They are very seasonal. I know you did a series on photography a while ago – what is your set up for close ups? Keep wondering if it would add to my fun in the woods. Very fun post. You have given me some interesting photos to work into my digital designs. 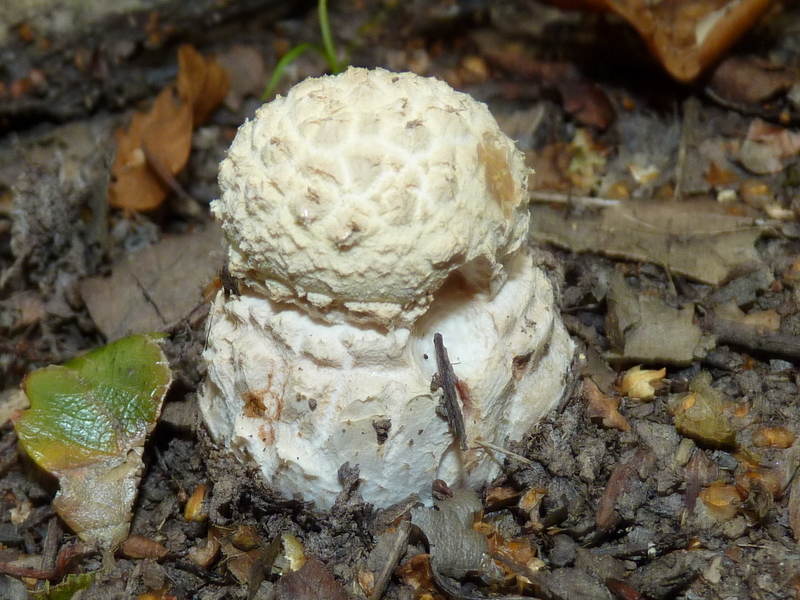 One group of Puffballs look like aliens to me. 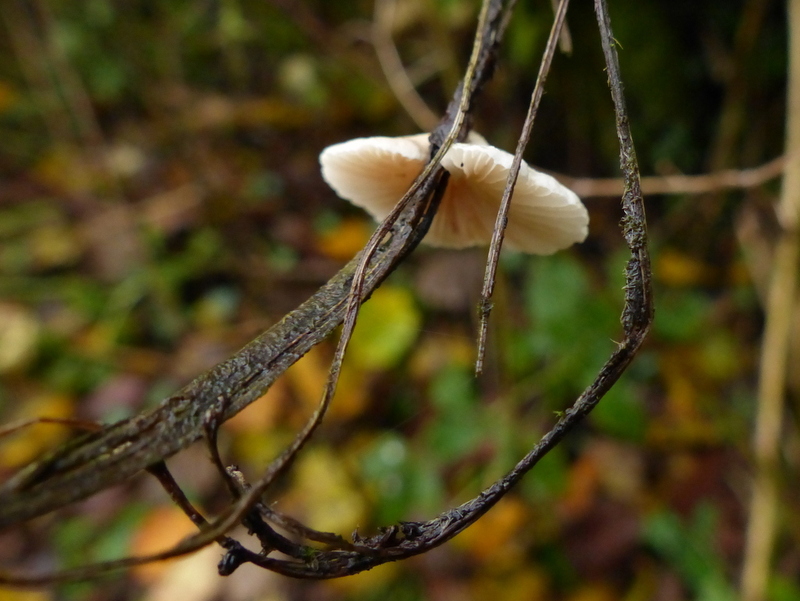 I saw a spaceship in another mushroom. Who knows what I’ll come up with? Happy Trails! 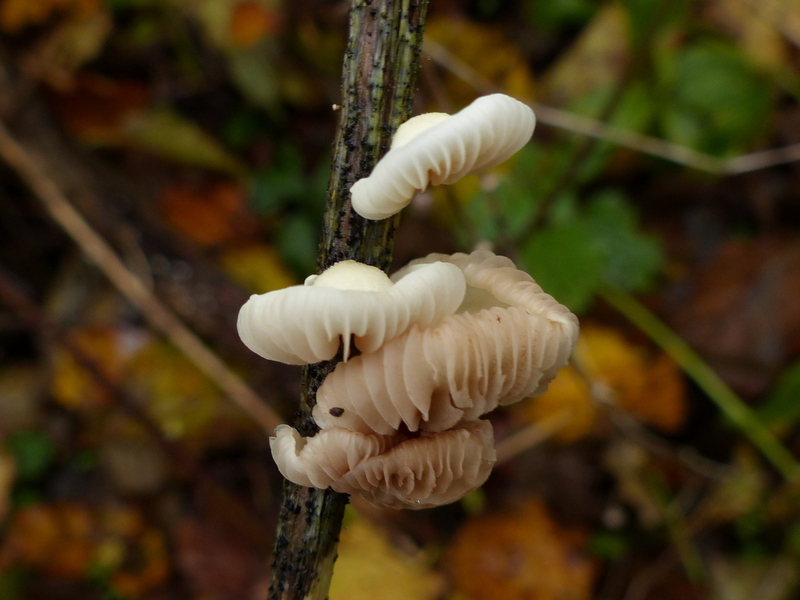 Brilliant work Sandi 🙂 You are going to change the way that I photograph fungi. I’ve never heard of making a ‘spore print’, that is something I want to try. Thanks for the clarification about the Puffballs, although I don’t intend to eat any soon. Thank you Joy 🙂 I won’t eat my puffballs either. 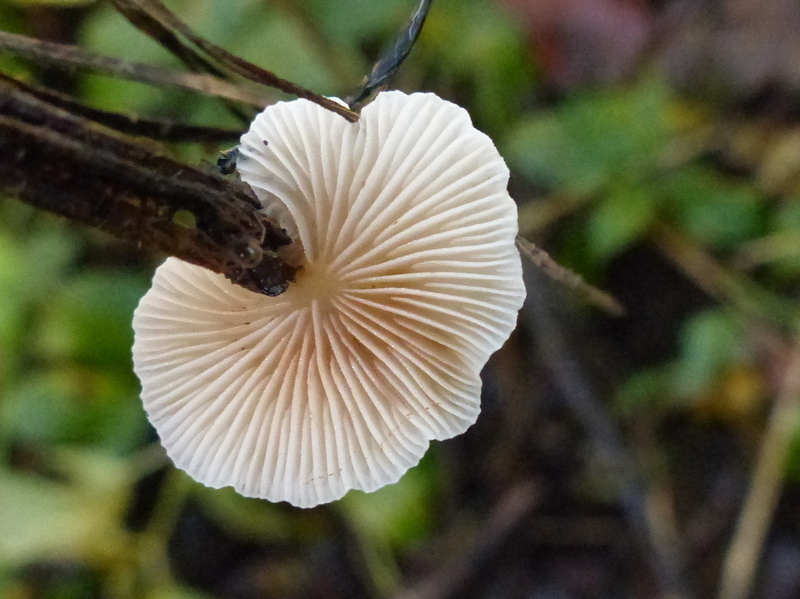 I want to photograph them as they mature and puff spores from them. So much info you give us, and so interesting, every day. You deserve good toast after such good work. And maybe a treat for your loyal side kick. Thank you Sarasin 🙂 Fizz will get her treat. I used to make mushroom prints with my kids. 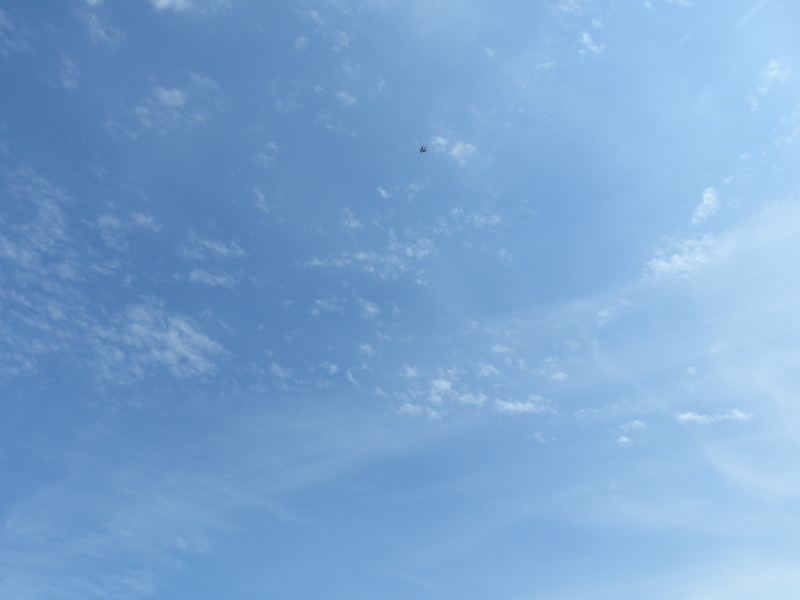 It was amazing to them to return and see the invisible made visible. Thank you Eliza 🙂 Mushroom Prints are great for kids. Thank you Stephanie 🙂 It sounds like you have the makings of a plan there. Of course your new found wealth would make it easy to attract another, possibly richer, partner and so on… just one thought, you would have to keep switching insurance companies 🙂 Happy trails. Your mushrooms are fascinating. Thanks. 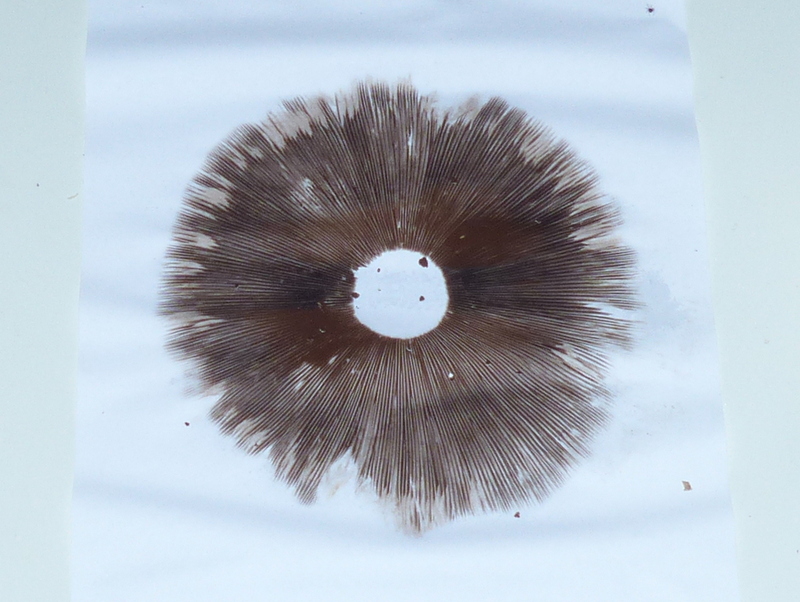 The spore photos are beautiful. Wish I were younger and could do some tramping again. Since I am bound to a wheelchair now, I will enjoy your adventures, along with Fizz. Thank you Ettel 🙂 It is always nice to have you along with us.